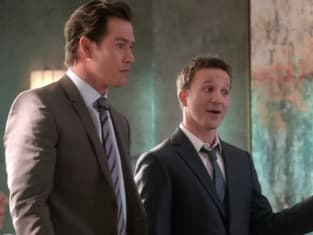 People do a lot of stupid, crazy things when it comes to love... so maybe Franklin & Bash Season 4 Episode 3 was correct,"Love Is the Drug. But I'm not all that sure Jimmy was really in love. Perhaps lust. Certainly infatuation…but does it really matter? He was a fool for it no matter what it's called. Never more so than when he went chasing after Sadie as she was hauled off in cuffs after trying to send him to prison for her crimes. The only disappointing part of the case was that we never really got to see any of those incredibly expensive handbags. I was rather enjoying the Monday meeting protocol when Infeld showed up and ruined the party vibe. Pizza for breakfast. No talking without being thrown the football and Instagram photo moments. What's not to like? Infeld seemed unamused. I think an associate parking in his parking spot probably made him cranky. His return was almost sidetracked by a decades old argument with a restaurant owner. It really had nothing to do with the restaurant. It was about a car and punches may not have been thrown back whenit began but they certainly were now. I had a certain amount of respect for Jared when he punched Mike Tyson after Tyson punched Infeld. It was like instinct for him to protect his friend. But the smarter part of my brain was yelling, Why isn't he running? Because let's face it, this was Mike Tyson. The man could break Jared into pieces and he's far too cute to have that happen. Jared didn't tell Dan-o, Danimal, let's just stick with Dan, to investigate Bob but he didn't exactly tell him not to either. Thankfully it worked in his favor. Ellen was right. Jared can be an idiot but he's an adorable idiot and he's definitely all hers. In the end, I couldn't believe it took the boys this long to introduce Infeld to their diner. Damn them, because now I have a craving for buffalo wings. TV Fanatics, what do you think of Dan, the investigator so far? He's quirky and fun. I think I need more time to warm up to him. The boys need to lock their bedroom doors.